Frank B. Brady lived with his wife Lou in Annapolis, Maryland. A professional engineer registered in the District of Columbia, he had a broad background in aviation and electronics and had retired as Executive Director of the Institute of Navigation, a Washington, D.C. based technical and scientific society. 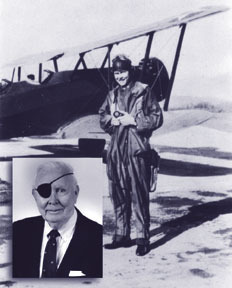 He was a recognized authority on the subject of aircraft and all-weather landing and was published extensively in that field. Mr. Brady was able to draw both on his technical education and his professional experience in coping with the problems that come with loss of vision in one eye.In addition to the book he has served as an expert witness in cases involving eye-loss. John W. McTigue, M.D., F.A.C.S., who wrote the foreword and served as medical consultant for this book was a practicing ophthalmologist in the District of Columbia with a distinguished background that included: Professor of Ophthalmology at George Washington University and Chairman of the Department of Ophthalmology at the Washington Medical Center. He is the author or co-author of a number of professional papers. In his introduction, Julius Axlerod, Ph.D., the distinguished Nobel Prize recipient from the National Institute of Health, shares his personal experiences regarding monocular vision.